No one ever said small can’t be big. That’s the message driven home with the inaugural SG:D Techblazer Awards. 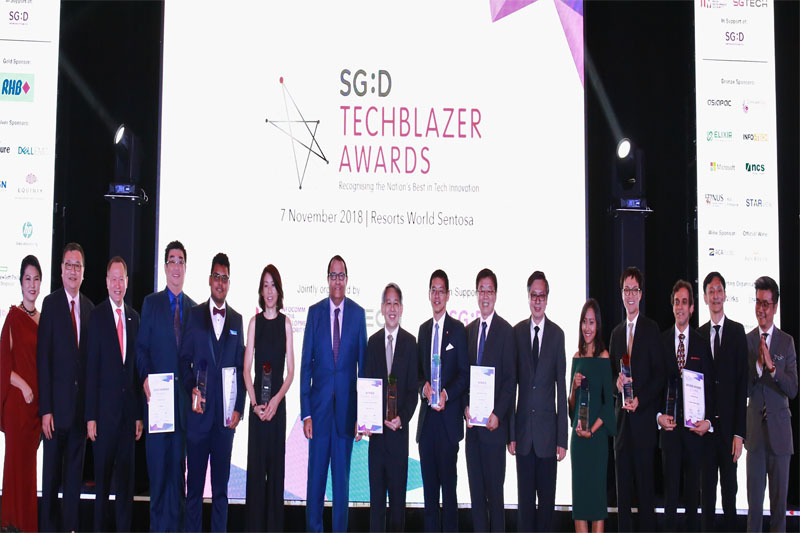 A union between the biannual National Infocomm Awards and the SiTF (Singapore Infocomm Technology Federation) Awards, the SG:D Techblazer Awards serve as a national-level endorsement for Singapore-based companies which have exemplified the spirit of innovation in technology development or adoption. Jointly organised by the Infocomm Media Development Authority and SGTech, the Award’s merger symbolises the strengthening digital transformation drive in Singapore. This year, the judging panel witnessed a staggering number of applications. A total of 331 applications were received. The largest applications it has received. Innovative infocomm media companies were nominated across three categories – Most Impactful, Most Promising and Best Adoption. Cumulatively, the categories award and recognised infocomm media companies across the all stages of a company’s growth story. The Most Impactful category for example, recognises companies which are already relatively more mature. Companies who applied under this category would submit a product or solution which bore cutting edge innovation and displayed a discernible level of impact. Impact was measured based on the way the product or solution improved the way businesses operate or enhanced the consumer’s quality of life. Three companies were honoured under this category. An e-commerce platform by M-DAQ Pte Ltd clinched gold, followed by two InsureTech companies, CXA Group Pte Ltd and Aida Technologies Pte Ltd in the silver and bronze category respectively. Under the Most Promising category another three other companies were awarded. This category recognises up and coming Singapore ICT companies which have fulfilled a marketplace need by creating a commercially viable business model around a product, service, process or a platform. These companies’ winning material would have the potential to be sustainable in the long run. Moreover, winning companies must demonstrate their ability to carve out new markets for themselves with high growth potential. Biofourmis Pte Ltd, a company focused on digital therapeutics, bagged gold with their BiovitalsTM Analytics Engine. The engine uses wearable technology to inform users on possible clinical exacerbation. Powered by artificial intelligence and data analytics, the technology can predict clinical exacerbation days in advance of a critical event. The last category, Best Adoption, was awarded one public and private sector organisation, namely the Housing & Development Board (HDB) and Changi Airport Group respectively. Public, private or SME sectors could be nominated under this category. The companies should have leveraged on technology to transform their business operations to increase competitive advantage, operational efficiency and enhance their productivity. In his opening speech at the SG:Techblazer Awards Presentation ceremony, the Minister also launched IMDA’s newest initiative – SG:D Spark. The initiative seeks to help promising B2B and B2C Singapore-based ICM startups build their business and compete through Government support and industry tools.